lil chung's lil adventures: 2 Top Chef Masters in 1 Day! 2 Top Chef Masters in 1 Day! As my time in Chicago draws to a close, I'm trying to cram in as many things to do in the little time I have left. Mostly, I'm just trying to eat at the places I missed last summer and so far this summer. Cupcakes really took over my past ten weeks so now I'm venturing out to eat real meals (also I'm sick of cooking). Grahamwich has been on my mind all summer. 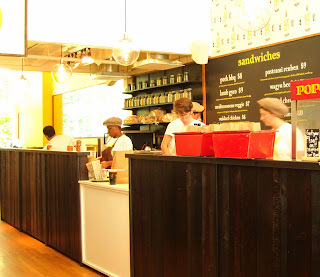 It's the sandwich/snacks/soda eatery from the Top Chef Masters contestant, Graham Elliot and also chef of the Michelin starred restaurant, Graham Elliot. Good food at a reasonable price, count me in! I FINALLY found the time to go since Grahamwich is only opened from 8am-5pm on most days. The restaurant itself is pretty tiny. There's a large communal table in the back and counters with stools along the front and side of the space. Luckily I went for a late lunch so it wasn't super crowded but I can only imagine how crazy it is during prime lunch hours. 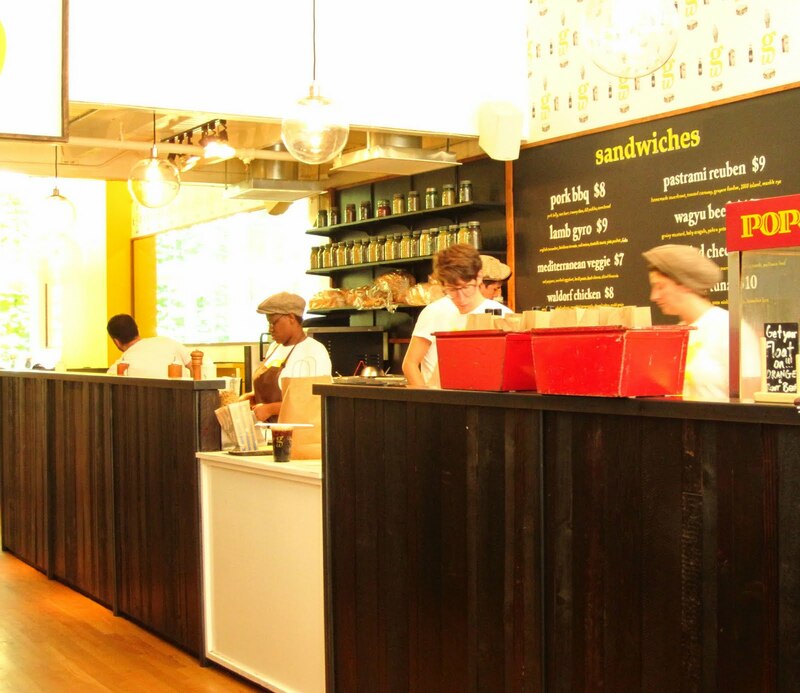 Grahamwich offers breakfast along with their usually lunch fare. For lunch, they have eight sandwiches on their menu and I chose the Wagyu Beef (mustard, field greens, potatoes, onion rings on a pretzel roll), while a friend decided on the Pork Bbq (pork belly, CORNBREAD crumblies--that's right, creamy slaw, and pickles on a sandwich roll). Both of these sandwiches were AMAZING. Both rolls were deliciously soft and warm while the whole package was just pure tasty goodness packed with lots of flavor. Their snacks include soft serve, popcorn, chips, salad and pickles. Their sodas are also homemade on tap. I, along with friend, opted to share a bag of their chips (topped with ranch powder, bacon bits, cheddar cheese and fresh herbs) and the vanilla bean soft serve (topped with nutella, caramelized bananas and marshmallow fluff!). Friend also ordered a root beer. I think the soft serve was just about the best ice cream sundae I've ever had. The whole combination of ingredients (esp the bananas) created one very amazing dessert. Usually I'm lucky to eat out once a day. But on this Grahamwich day, I went out to dinner to another Top Chef Masters contestant's restaurant: Rick Bayless's XOCO. There were originally plans to go to Rick's other restaurant, Frontera Grill, but sans reservations and empty stomachs, the two hour wait to get seated was just not gonna happen. Rick Bayless's restaurants are cleverly next door to each other. So if the fancier Topolobampo and Frontera Grill are packed, head right over to the counter service at XOCO, genius. I've quickly become a HUGE fan of cheap, good food by these fancy chefs. While the menu is quite limited at XOCO (mainly tortas and Mexican soup), there's still quality and yumminess in the food. Best part of the meal and a theme for the day: DESSERT! CHURROS. My only previous experience has been at Disneyland in 1996. 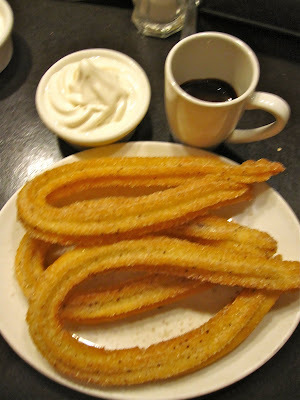 XOCO churros are crispy, yummy and amazing, esp if you get a chocolate shot and soft serve with your churros.